Left-wing Gush Shalom wants Israel to cancel Jerusalem Day saying it is a holiday for "racist nationalists and settler provocateurs." The radical left-wing Gush Shalom organization has called for Israel to cancel Jerusalem Day. "The holiday marking the annexation of Palestinian territory now called 'East Jerusalem' under the cover of a false unification is not an event to celebrate as it was not a unification, but the imposition of occupation and oppression of the Palestinian people," the group's press release said. East Jerusalem, as well as Judea, Samaria, and Gaza, were Arab occupied areas of the former British Mandate. Arab residents of East Jerusalem, Judea and Samaria, which Jordan occupied illegally, held Jordanian citizenship, and Arabs in Gaza Egyptian citizenship, from 1949-1967. 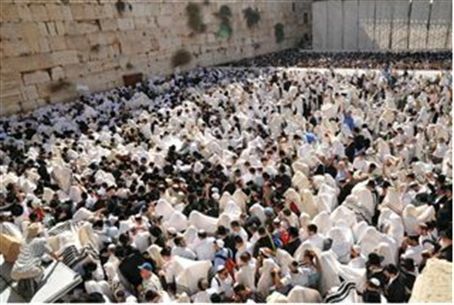 "Along with receiving access to the 'Wailing Wall,' Jews denied the rights of the residents of Occupied Territories - Muslims and Christians - to pray in their holy places," the statement continued. On the contrary, Israel has, since liberating Jerusalem in 1967, ensured Muslims and Christians unfettered access to their churches and mosques, going so far as to leave the administration of Judaism's holiest site - the Temple Mount - in the hands of the Muslim Waqf, a controversial decision which led to Jews not being allowed to pray there, while thousands of Arabs pray there at will. It is only when there are security warnings that access to the Temple Mount is limited for Arabs. "This is a great holiday for racist nationalists and settler provocateurs," The statement continued, "But the nature of this nasty fake holiday called Jerusalem Day parade is a provocation. The flag parade of the settlers and their collaborators from Jaffa Street in West Jerusalem into the heart of Sheikh Jarrah, an act of provocation to the Palestinian residents who have already suffered greatly from settler violence," the statement said. Several attacks in East Jerusalem were made on Israelis celebrating Jerusalem Day, including an attempted lynching. "The vast majority of Israeli citizens, including Israelis living in Jerusalem itself, rightly see Jerusalem Day as a nuisance rather than a holiday for them," the statement claimed. Eighty Israeli townships held Jerusalem Day celebrations this year and politicians from across the gamut - including peace camp icon and Oslo Accords architect President Shimon Peres - participated. The Prime Minister and Speaker of the Knesset Ruby Rivlin spoke at Merkaz HaRav Yeshiva in Jerusalem. "Jerusalem, as you celebrate your freedom today, we stand in your gates, and bemoan the sons that have fallen on your walls, for bringing our historical capital to life - the eternal capital of our people," Peres said in his official address. Gush Shalom called for Jerusalem Day to be celebrated upon the city's division between Israel and the PA.
"When the peace agreement is signed between Israel and the Palestinian State, which will include the making East Jerusalem the capital of Palestine and the international community's recognition of West Jerusalem as Israel's capital, it would be appropriate to declare that day the real Jerusalem day. Then we will be able to celebrate together, Israelis and Palestinians, all lovers and seekers of Jerusalem, a city of all its inhabitants and the capital of peace," the statement concluded.